Catastrophic Plate Tectonics (CPT) claims support from the existing evidence for Uniformitarian Plate Tectonics (UPT). However, details of CPT theory appear to be inconsistent with several key tenets of UPT theory. One major point of divergence is the Wilson cycle. Baumgardner proposed that a ‘Pangean’ supercontinent was pulled apart at the initiation of the Flood by gravity-induced subduction of the 50 to 100 km thick ‘Paleozoic’ pre-Flood oceanic floor. Freshly extruded, hot, thin, oceanic floor rapidly formed at spreading ridges between the new continents. Continental motion was toward the subduction zone. 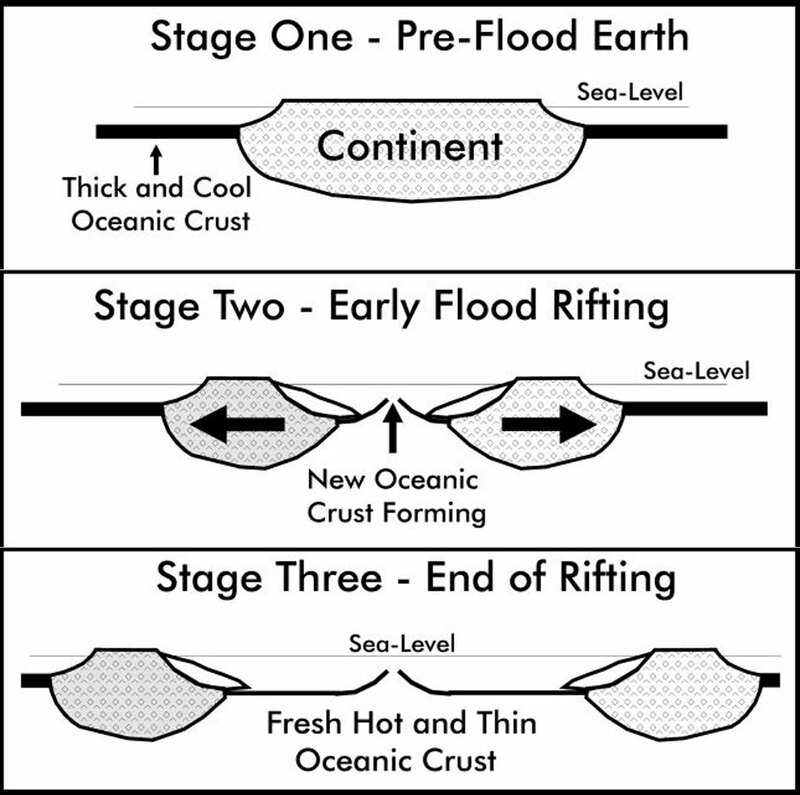 It is not apparent how the hot and thin oceanic floor could cool rapidly enough to allow subduction to occur later during the Flood, thus pulling the continents back in the opposite direction as required by a Wilson cycle. One well-known example of a Wilson cycle comes from UPT evidence of the Iapetus and Atlantic Ocean basins. CPT appears incapable of supporting a single Wilson cycle using the same UPT evidence. Such discrepancies between UPT and CPT suggest a need for caution and further clarification before CPT can gain acceptance. Figure 1. A diagram showing the pre-Flood ‘Pangean’ supercontinent breaking apart. Advocates of CPT have proposed that the continents moved across the globe toward subduction zones during the Flood. This was accomplished by the gravity-induced subduction of the 50 to 100 km thick ‘Paleozoic’ pre-Flood oceanic floor. This is one-half of the UPT Wilson cycle. Although Catastrophic Plate Tectonics (CPT) relies on Uniformitarian Plate Tectonic (UPT) evidence, it does not consistently follow its tenets.1 This fact was recently made clear in a forum on CPT held between John Baumgardner and Michael Oard in Journal of Creation.2,3 I applaud Baumgardner for his efforts to explain some of the details of CPT theory; however, his interpretation appears to be inconsistent with much of the UPT dataset that he uses for its support. 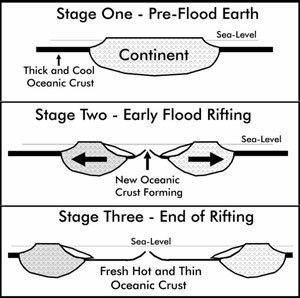 The Wilson cycle is a key concept in UPT theory and should play an important role in CPT.4 The recognized succession of tectonic events associated with a Wilson cycle begins with continental intraplate rifting and the effusion of flood basalts. Hypothesized convection currents originating from close to the outer core, circulate within the mantle and serve to break the continent apart along the newly formed rift margin. Purportedly, at some later period of time the continents return together (not necessarily at the same location) by subduction. Ultimately, these crustal collisions create mountain ranges. According to UPT theory, the continental margin surrounding the North Atlantic Ocean Basin is believed to reflect possibly two Wilson cycles. The first Wilson cycle created the historical Iapetus Ocean basin, which later closed. Later, rifting of the continent resulted in the opening of the modern Atlantic oceanic basin. However, Baumgardner’s explanation of CPT does not appear to provide sufficient opportunity for even one Wilson cycle in support of either the Iapetus or the Atlantic Ocean. Thus, with regard to the evidence used to support a Wilson cycle, it would appear that UPT and CPT are not mutually inclusive5. CPT does not appear to provide sufficient opportunity for even one Wilson cycle in support of either the Iapetus or the Atlantic Ocean. From its earliest proposal, proponents of CPT have claimed that its support comes from the existing UPT dataset.4,6 Baumgardner has reiterated this claim in his recent discussions supporting CPT.7–10 Wilson cycles are used to explain the motion of the continents over time and are believed to be supported by UPT datasets derived from paleomagnetism (e.g., polarity and paleo-wandering paths), paleontology, and tectonics. Thus, this same evidence should be available to support Wilson cycles in CPT. Figure 2. A diagram showing the continents returning together by subduction in an opposite direction. This process completes a single Wilson cycle. CPT does not appear capable of explaining how continental drift could pull the continents back together again using the newly-formed hot and thin oceanic floor, which would lack either the rigidity or weight to allow an opposing subduction zone to form. Baumgardner stated that the ‘Paleozoic’ pre-Flood oceanic floor was subducted with the onset of the Flood, pulling apart the formerly unified landmass.11 Subduction in this setting, especially considering that the oceanic floor is 50–100 km thick,12 would move the continents in one direction, and only for the distance equal to the original pre-Flood oceanic basin. The pre-Flood Pangean supercontinent would break apart at the onset of the Flood. The individual continents would separate with the subduction of the 50 to 100 km thick pre-Flood ‘Paleozoic’ oceanic floor, forming the Iapetus Ocean (Figure 1). The thin, hot, and freshly extruded oceanic floor that filled the space following the movement of the continents would have to rapidly cool, break apart along an opposing margin, and then subduct, pulling the continents back toward their original position. This would accomplish the reunification of separated continents and close the Iapetus Ocean (Figure 2). 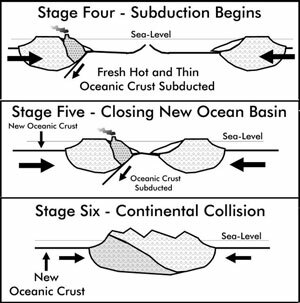 The rapid cooling of the last-formed hot oceanic floor created during the reunification of the continents would again break apart and subduction would once more begin pulling the continents apart for the final time, forming the Atlantic Ocean basin (Figure 1). The steam jet model11,17 as postulated by the advocates of CPT, would truly need to be efficient to cool the twice-formed oceanic floor during the Flood. A credible explanation needs to be provided, demonstrating how the Iapetus and Atlantic oceanic basins are possible within the constraints of the CPT model, or why this aspect of UPT is invalid. CPT derives much support from UPT evidence. The Wilson cycle is a key component of UPT. Baumgardner’s recent defense of CPT reveals a serious problem with the Wilson cycle concept, once the original pre-Flood ‘Paleozoic’ oceanic floor was supposedly subducted. Baumgardner has suggested that the weight of the original 50 to 100 km thick pre-Flood oceanic floor would simply have pulled it into the mantle once gravity-induced subduction began. This would appear to be a one-way process as the newly created oceanic floor, only a few meters thick, could not provide the lateral force necessary to initiate subduction in an opposing direction. Neither would it have the necessary lateral strength to pull an adjoining portion of continental crust along with it. Without the capability to move the continents first in one direction and later another as required by the Wilson cycle concept, CPT appears to lack a means to support this concept in UPT theory. For this reason, serious questions remain as to the applicability of UPT evidence to CPT. Those questions could be answered by providing an explanation using the Iapetus/Atlantic oceanic basins as an example. I thank my wife, Susan for her continued support of my research and writing efforts. Emmett Williams, John Reed and Jerry Akridge kindly provided review and helpful comments. Any mistakes that remain are my own. Glory to God in the highest (Proverbs 3:5–6). Reed, J.K. (Ed. ), Plate Tectonics: A Different View, Creation Research Society Books, St. Joseph, 2000. Return to text. Baumgardner, J.R., Catastrophic plate tectonics: the geophysical context of the Genesis Flood, pp. 58–63; Dealing carefully with the data, pp. 68–72; A constructive quest for truth, pp. 78–81, Journal of Creation 16(1), 2002. Return to text. Oard, M.J., Is catastrophic plate tectonics part of Earth history? pp. 64–68; Does the catastrophic plate tectonics model assume too much uniformitarianism? pp. 73–77; Dealing carefully with the data, pp. 82–85; Journal of Creation 16(1), 2002. Return to text. Austin, S.A., Baumgardner, J.R., Humphreys, D.R., Snelling, A.A., Vardiman, L. and Wise, K.P., Catastrophic plate tectonics: a global Flood model of Earth history; in: Walsh, R.E. (Ed. ), Proceedings of the Third International Conference on Creationism, Technical Symposium Sessions, Creation Science Fellowship, Pittsburgh, pp. 609–621, 1994. Return to text. Froede, C.R., Jr., Questions regarding the Wilson cycle in Plate Tectonics and Catastrophic Plate Tectonics; in: Reed, J.K. (Ed. ), Plate Tectonics: A Different View, Creation Research Society Books, St. Joseph, pp. 147–160, 2000. Readers interested in additional information about the Wilson cycle concept in UPT should review this reference. Return to text. Snelling, A.A. Plate Tectonics: have the continents really moved apart? 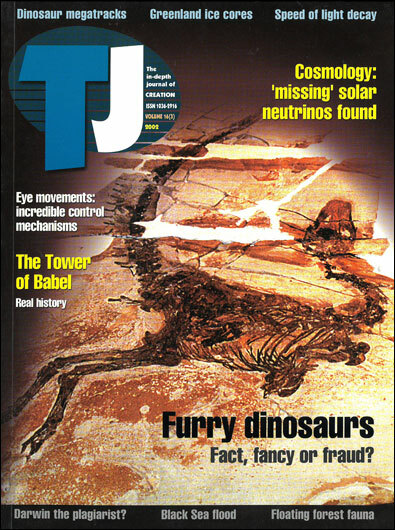 Journal of Creation 9(1):12–20, 1995. Return to text. Baumgardner, J., Have the continents really moved apart? Journal of Creation 15(3):36–38, 2001. Return to text. Baumgardner, Ref. 2, pp. 58–63. Return to text. Baumgardner, Ref. 2, pp. 68–72. Return to text. Baumgardner, Ref. 2, pp. 78–81. Return to text. Baumgardner, Ref. 2, p. 61. Return to text. Baumgardner, Ref. 7, p. 38. Return to text. Austin et al., Ref. 4, p. 612. Return to text. 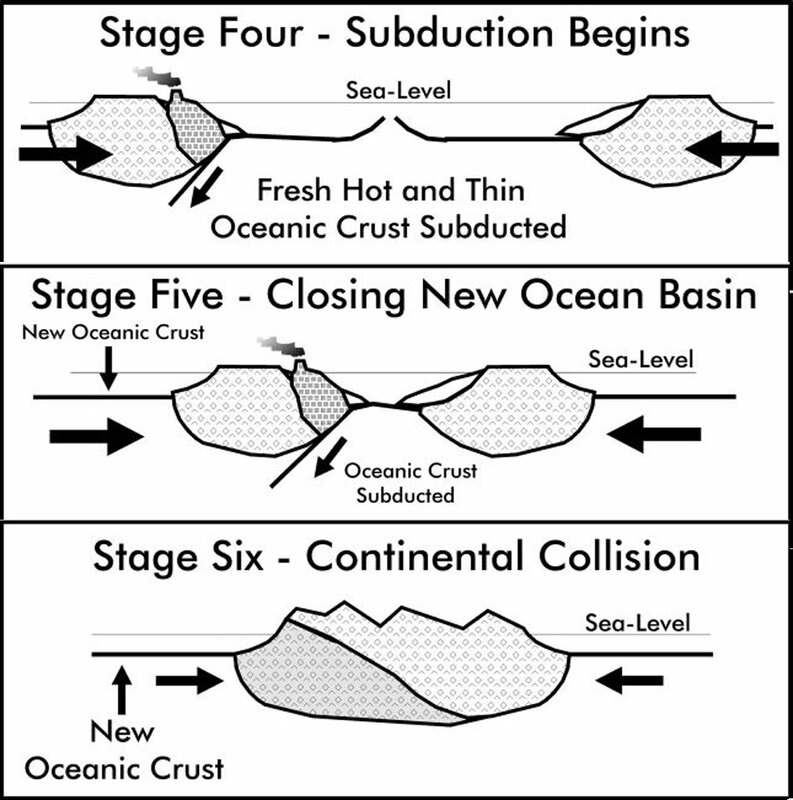 Froede, C.R., Jr., The heat issue within catastrophic plate tectonics, CRSQ 35:46–47, 1998. Return to text. Froede, C.R., Jr., Heat issue in catastrophic plate tectonics, CRSQ 35:234, 1999. Return to text. Burnett, D. and Quirk, D., Iapetus; in: Hancock, P.L. and Skinner, B.J. (Eds), The Oxford Companion to the Earth, Oxford University Press, New York, pp. 524–525, 2000. Return to text. Austin et al., Ref. 4, p. 612–613.